I've been busy getting ready for the holidays. I LOVE using my scraps!! some of the plaid shirts that I like to use. This little quilt is 6" square. I hung up an old friend!! It's FUN to sew for the SEASONS! The little tree ornaments are adorable. They look like they would be fun to make. Oh my goodness! These are all so cute!! I love all your little scrappy projects. It gives me ideas for fun things to make. LOVE your fall quilt..was it a pattern or just your own free-form, wingin' it design? Either way, it's LOVELY! What a wonderful color sense you are showing in that pretty 6 inch small quilt in all the shades of candy corn. Your projects always inspire me. 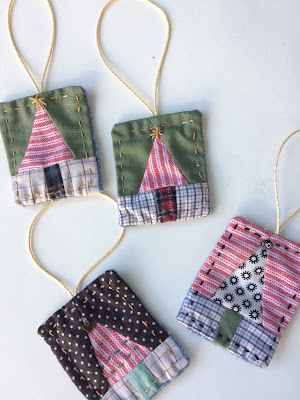 Very fun seasonal sewing projects. I'm so not ready to think about Christmas! Such fun work! Love those little tree ornaments. Your scrap quilts are darling. I like those plaids too! The pumpkinquilt and the little tree quilt are the most wonderful tiny quilts I've ever seen. I'am completely in love with them! نحن أفضل شركة سعودية تعمل على شركة جلي بلاط بالرياض , تتخصص فى مجالات جلى البلاط المتميزة اعتمادا على أفضل الأساليب وأفضل الأسعار المميزة التى يتم تقديمها للعديد من الأفراد ممن يحتاجون هذه الخدمة ؛ فالهدف الأساسى من مجموعة الحارثى هو تلبيه احتياجات الأفراد بأسعار معقوله تناسب امكانياتهم شركة جلى بلاط بالرياض ؛كما تعد هذه الخدمة من الخدمات الفريدة من نوعها التى لا تقدم جميع الشركات ؛ بل شركتنا من أبرز الشركات التى تقدم هذه الخدمة الحصرية .